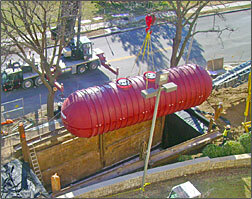 Installation of Underground Storage Tank. Genesis Environmental Solutions’ Remediation and Construction division is focused on the cleanup of contaminated sites, removal of underground storage tanks and other infrastructure elements, and the installation of new storage tanks and related appurtenances. Our department provides for work as a general contractor or subcontractor, depending on the situation. We provide services to ensure a “turn-key” project to assure our client’s peace of mind and satisfaction. Our field personnel are all OSHA 40-hour HAZWOPER and confined space trained and equipped to handle any environmental concern that may arise. Our department also provides for emergency response work such as spill response and removal of discovered tanks. We can provide service during any shift period and are available on a 24-hour basis.